CLOSE THE GAP. GET CONNECTED. GET CLINCHED. THE CLEANEST, SAFEST, MOST FAMILY- FRIENDLY MARTIAL ARTS ACADEMY IN MARYLAND. SET UP YOUR 2 FREE CLASSES HERE! LUKE IS THE OWNER AND HEAD INSTRUCTOR AT THE CLINCH ACADEMY. HAVING TRAINED SINCE 1983 AND TEACHING SINCE 1993, LUKE BRINGS A PLETHORA OF KNOWLEDGE AND EXPERIENCE TO HIS STUDENTS. IN HIS YEARS OF TRAINING LUKE HAS EARNED BLACK BELTS IN TANG SOO DO, SELF-DEFENSE TACTICS & BRAZILIAN JIU-JITSU. LUKE HAS ALSO STUDIED INTENSELY IN KENPO, KICKBOXING, MUAY THAI AS WELL AS OTHER GRAPPLING ARTS OUTSIDE OF BJJ. MARTIAL ARTS IS A PASSION FOR LUKE AND LIVING A LIFE THAT REFLECTS THE WARRIOR CODE IS EQUALLY IMPORTANT. AS A CHRISTIAN LUKE VIEWS THE WARRIOR CODE AS THE FRUIT OF THE SPIRIT MENTIONED IN GALATIANS 5…LOVE, JOY, PEACE, PATIENCE, KINDNESS, GOODNESS, GENTLENESS AND SELF-CONTROL. AGAINST THESE THERE IS NO LAW! CATY AND LUKE HAVE BEEN MARRIED SINCE 2005 AND SHE HAS OFFICIALLY BEEN PART OWNER OF THE CLINCH ACADEMY SINCe 2015. CATY HAS TRAINED OFF AND ON WHILE BALANCING WORKING IN THE BUSINESS AS ACTING TREASURER AND SECRETARY, HOME LIFE AND EVEN HOMESCHOOLING THEIR 3 CHILDREN BRAESEN, BRONWYN AND JUDAH. CATY HAS EARNED HER BLUE BELT IN BRAZILIAN JIU-JITSU AND IS A LEVEL 1 CERTIFIED STRIKE FIT COACH. GRADUATING FROM CHAPEL HILL NORTH CAROLINA WITH HER DEGREE IN EXERCISE SCIENCE, CATY OFFERS A LOT TO CLINCH ACADEMY STUDENTS FROM BOTH A PHYSICAL & MENTAL PERSPECTIVE. Caty also has a passion for helping others establish a healthy lifestyle whether it be nutrition, communication or just an overall way of approaching life! TOM LEDWELL IS THE FORMER FREDERICK POLICE CHIEF. 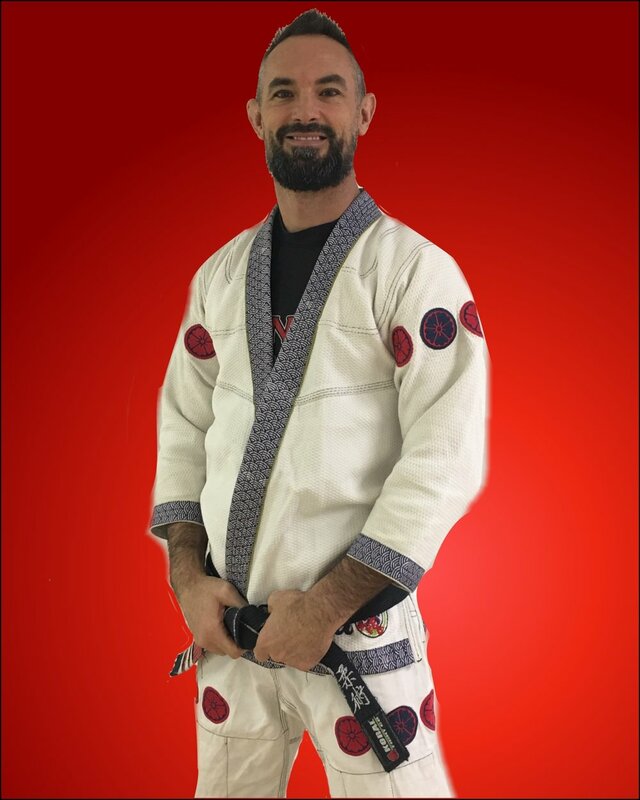 TOM HAS BEEN WITH CLINCH ACADEMY SINCE 2005 AND HOLDS A SECOND DEGREE BLACK BELT IN BRAZILIAN JIU-JITSU. TOM HAS BEEN AN INSPIRATION TO MANY STUDENTS AT THE ACADEMY SINCE HE HAS STRUGGLED WITH ARTHRITIS FOR MANY YEARS AND HAS HAD TO WORK AROUND AND MODIFY HIS GAME ACCORDINGLY. ANYONE THAT ROLLS WITH TOM KNOWS THAT HIS TECHNIQUE IS INCREDIBLE EVEN THOUGH HE HAS HAD THESE STRUGGLES. PERHAPS THESE STRUGGLES HAVE EVEN MADE HIS GAME MORE EFFECTIVE! TOM WAS A CERTIFIED MARYLAND POLICE AND CORRECTIONS DEFENSIVE TACTICS AND GENERAL INSTRUCTOR EVEN WINNING A INSTRUCTOR OF THE YEAR AWARD! NOW TOM LIKES TO PASS HIS KNOWLEDGE AND PASSION ONTO HIS STUDENTS! Ken showed up at the Clinch Academy all ready blue belt in brazilian jiu-jitsu and a Black Belt in Tae Kwon Do. In 2017 Ken received his Black Belt in Brazilian Jiu-Jitsu at the Clinch Academy. Ken is now one of our “Adult BJJ Light Combatives” Instructors. Our Combatives class is our Beginner level Jiu-Jitsu Class. If you are looking to ease your way into jiu-jitsu, Ken’s class could be the perfect one for you! Matt Semelsberger is one of our Professional Mixed Martial Arts Fighters. With a wrestling and Collegiate Football background Matt brings a lot of competitive experience to the table. 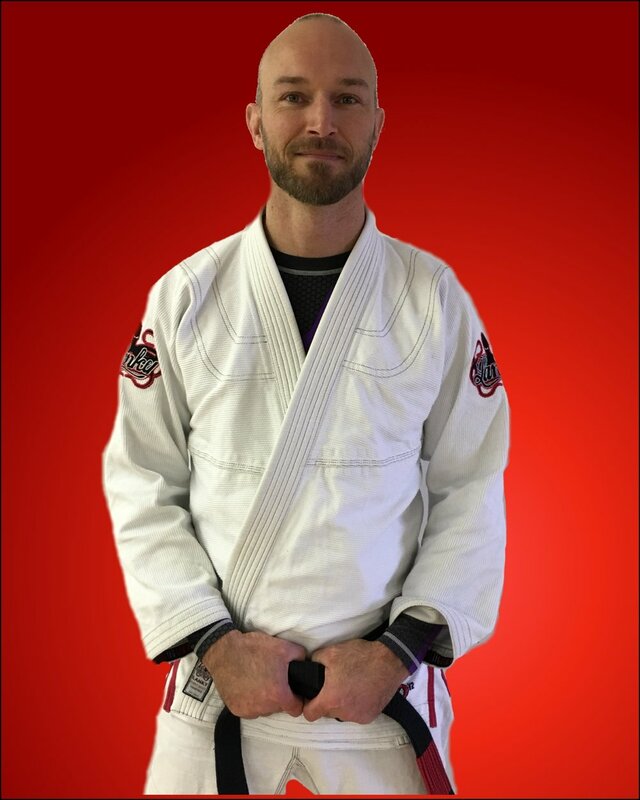 Currently a Blue Belt in Brazilian Jiu-Jitsu, Matt also trains in Kickboxing, Muay Thai and teaches our BJJ Combatives and Strike Fit & Kickboxing classes. If MMA is an interest of yours, Matt classes are where you want to be! Thomas “Tommy” Brooks began training at the Clinch Academy in 2016. Currently a Blue Belt in Brazilian Jiu-Jitsu, Tommy is also one of our Youth Assistant Coaches. You may also see him working the front desk from time to time. Natalie began training in our Strike Fit program at Clinch Academy in 2014. Now Natalie is a Level 1 Strike Fit Instructor and teaches our Women’s Only Strike Fit class. Recently, Natalie has also began her journey in Brazilian Jiu-Jitsu! If you want to have fun getting in shape, while also learning how to effectively punch and kick, come try one of Natalie’s Strike Fit Classes! 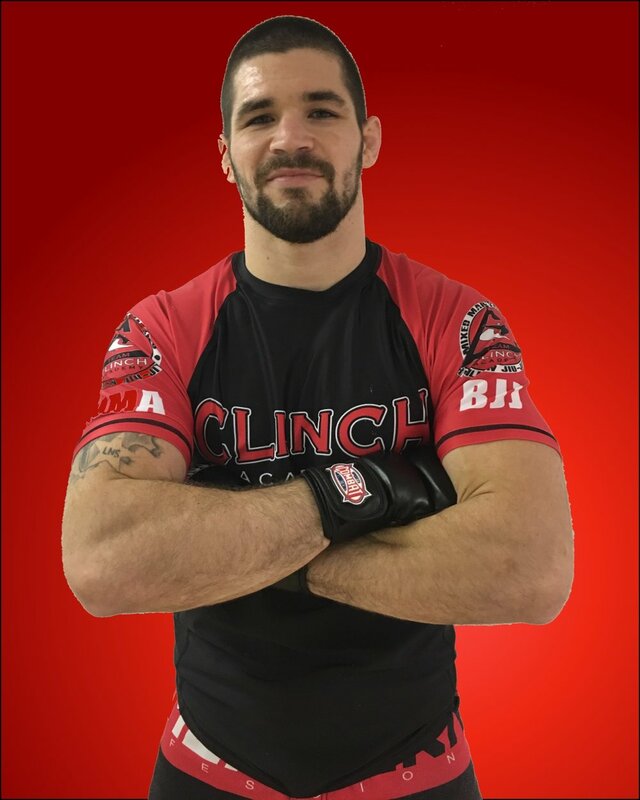 JASON MCDONALD HAS BEEN WITH THE CLINCH ACADEMY SINCE 2006 AND EARNED HIS BRAZILIAN JIU-JITSU BLACK BELT IN 2016. JASON ALSO HAS EXPERIENCE IN WRESTLING, KICKBOXING, KARATE AND MMA. CURRENTLY JASON TEACHES OUR ADULT NO-GI JIU-JITSU AND HELPS COACH IN OUR YOUTH MMA PROGRAM. JASON’S DAUGHTERS CAROLINE AND ELLA BOTH TRAIN AT CLINCH ACADEMY AS WELL! Mark Kroh has been with Clinch Academy since 2008. 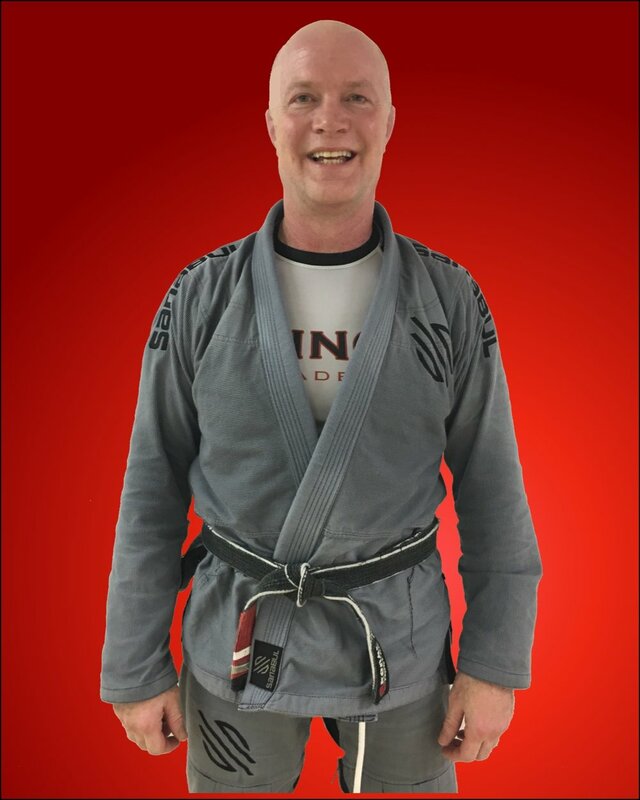 Mark earned his Black Belt in Brazilian Jiu-Jitsu in 2018 but has also trained in our Kickboxing & MMA Programs as well. Currently Mark is teaching our Tuesday & Thursday 6:30 am BJJ class. If you are an early riser maybe you should give Coach Mark a visit in the a.m.! Russ Braden is another Karate Black Belt who has migrated into the jiu-jitsu world. Currently a Purple Belt in Brazilian Jiu-jitsu as well as having years of experience in Kickboxing at Clinch Academy, Russ is one of our Youth MMA and Strike Fit Coaches. Chris began his journey at the Clinch Academy in 2016. Currently Chris is a Blue Belt in Brazilian Jiu-Jitsu, a youth assistant coach and the nice cheerful guy assisting you at the front desk! If you have any Membership questions or needs, Chris will be glad to serve you! Betty Harget began her journey at the Clinch Academy by joining one of G.I. Judy’s Women Only Fitness Bootcamps back in 2013. Betty has since earned her Blue Belt in Brazilian Jiu-Jitsu and has also become a Level 1 Strike Fit Instructor. Currently Betty teaches one of our Co-Ed Strike Fit Classes. If you are looking to punch and kick your way into shape, you need to come pay Betty a visit! Brandy Madison is the wife of Professor Joshua Madison. Brandy began training in BJJ at Clinch Academy in 2017. Currently Brandy has her white belt with 2 blue stripes and is an Assistant Coach in our Lil’ Warrior and Youth Programs. JOSHUA MADISON HAS BEEN WITH CLINCH ACADEMY OFF AN ON SINCE IT’S BEGINNING YEARS. JOSHUA EARNED HIS CLINCH ACADEMY BJJ BLACK BELT IN 2017 AND IS AN INSTRUCTOR FOR OUR YOUTH MMA, YOUTH BJJ, & ADULT BJJ COMBATIVES PROGRAMS. JOSHUA’S WIFE BRANDY (WHOM YOU WILL SEE BELOW) ALSO TRAINS ALONG WITH HER KIDS WALTER AND KAILYN! JOSHUA’S SON’S NATHANIEL AND ISAAC HAVE BOTH ALSO TRAINED HERE. Joshua is currently one of our BJJ Combatives Instructors as well as Youth MMA and Youth BJJ! Judy made her way to Clinch Academy after already achieving her Black Belt in Tae Kwon Do. Judy is currently a 1st Degree Black Belt in Brazilian Jiu-Jitsu. Also known as G.I. Judy, she has run many Women’s Only Fitness Boot Camps at the Clinch Academy. This helps explain why everyone struggles during Judy’s warm-ups in our Adult BJJ Master Class! With a wrestling background Matt Crutchfield wasn’t new to grappling when he came to Clinch Academy. Currently a Blue Belt in Brazilian Jiu-Jitsu Matt is one of our Youth Brazilian Jiu-Jitsu Coaches. Matt’s also has several of his kids who train in the youth BJJ program. Luke began his training at Clinch Academy in 2016. Currently a Blue Belt in Brazilian Jiu-Jitsu, Luke also is one of our Amatuer MMA Fighters and Assistant Youth Coaches. Steve Connor has been with the Clinch Academy since 2005. Steve came to Clinch Academy with a Black Belt in Karate and has eArned his Black Belt in CFK Kickboxing and a Purple Belt In Brazilian Jiu-Jitsu. Steve has been one of our Kickboxing Instructors and is currently our AM Title Fight Fitness Instructor. If you are looking for a great morning workout Steve’s class is just what you need! SIGN UP FOR YOUR 2 DAY FREE TRIAL! Name, age, experience if any and classes interested in. Check 1 Box or check all! QUESTION: AM I GOING TO GET HURT? ANSWER: WE TRY OUR ABSOLUTE BEST TO MAKE SURE THAT ANYONE CAN SAFELY TRAIN AT OUR ACADEMY. WE WANT YOU TO BE ABLE TO TRAIN AND CONTINUE TRAINING SO THAT YOU CAN REAP THE BENEFITS OF MARTIAL ARTS. WE ALSO STRUCTURE OUR CLASSES SO THAT BEGINNER STUDENTS ARE SEPARATED OUT FROM THE ADVANCED SO THAT NEW STUDENTS AREN’T ENTERING IN TO ADVANCED TRAINING. WITH THAT BEING SAID, IT IS STILL A FULL CONTACT SPORT. NOT THAT YOU ARE ALWAYS SPARRING AND FIGHTING BUT THE PRACTICE ITSELF IS VERY HANDS ON. STUDENTS DON’T GET ANY MORE INJURED AT OUR ACADEMY THAN THEY WOULD PLAYING OTHER SPORTS. ALL SPORTS COME WITH THEIR ACHES AND PAINS BUT WE HAVE LEARNED THAT IT IS BETTER TO FEEL ACHY FROM BEING ACTIVE THAN IT IS FROM SITTING ON THE COUCH! ANSWER: Here at CLinch Academy we don’t sell monthly memberships but programs. When you sign up you will be signing up for our BJJ program, our Kickboxing, Mixed Martial Arts or Fitness programs. We do also sell multiple program packages. Since we function like this we don’t really have contracts. We do have enrollment terms and monthly installment options but any of these options can be cancelled with a 30 days notice and no cancelation fees! ANSWER: YES! WE OFFER FAMILY MEMBERSHIP PACKAGES FOR FAMILIES OF 3 OR MORE! QUESTION: DO YOU OFFER LAW ENFORCEMENT, FIREFIGHTER OR MILITARY DISCOUNTS? ANSWER: YES! WE OFFER 10% OFF FOR ALL THE ABOVE! QUESTION: WHAT KIND OF GEAR DO I NEED? ANSWER: DEPENDING ON YOUR CLASS YOU MAY NEED VARIOUS KINDS OF GEAR. IN BJJ A GI (UNIFORM) IS REQUIRED AND A MOUTHPIECE IS HIGHLY RECOMMENDED. IN KICKBOXING CLASSES YOU WILL NEED KICKBOXING GLOVES, SHIN GUARDS AND A MOUTHPIECE. IN MIXED MARTIAL ARTS CLASSES YOU WILL NEED MMA GLOVES AND A MOUTHPIECE. OUR STRIKE FIT PROGRAM WOULD ALSO REQUIRE THAT YOU HAVE KICKBOXING GLOVES. WE DO SELL ALL THE GEAR HERE AND IT MAY EVEN BE ROLLED INTO YOUR MEMBERSHIP PACKAGE DEPENDING ON YOUR MEMBERSHIP. QUESTION: WHAT AGES DO YOUR CLASSES BEGIN? ANSWER: WE OFFER LIL WARRIOR CLASSES FOR 4 & 5 YEAR OLDS, YOUTH PROGRAMS ARE FOR 6-13 YEAR OLDS AND OUR ADULT PROGRAMS ARE AGES 14 AND UP. QUESTION: WHEN AND HOW CAN I GET SIGNED UP? ANSWER: YOU CAN SIGN UP AT ANY TIME! WE ALWAYS OFFER A FREE 2 CLASS TRIAL AND FREQUENTLY OFFER LONGER TERM DISCOUNTED TRIALS. YOU CAN CLICK RIGHT HERE TO get your 2 free classes set up!